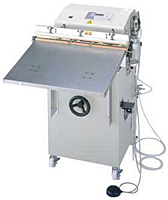 The VG-402 and 602 series impulse sealers are high-precision vacuum sealing & gas flushing sealing equipped with a state-of-the-art temperature control system. The VG-402 and 602 series feature the heating-temperature control ONPUL system. ONPUL makes high-precision vacuum sealing and sealing through gas flushing possible. When you want to flush air inside of the bag and reduce the package volume, or when you want to utilize oxygen scavengers to extend product life, you can use the vacuum sealing function. The gas flushing function can be used to fill the bag with carbon dioxide to prevent spoilage and mold growth, or with nitrogen gas to prevent oxidation. To set and maintain optimal sealing conditions: Unlike other conventional timer-operated models, heating temperature is controlled by high precision sensor and microcomputer that consistently monitor the exact temperature that film melts regardless of air temperature or increasing sealer temperature during its prolonged use. Cost Effective: To provide overall competitive advantage from power saving with minimal heating from effective power consumption ratio to operating efficiency, coupled with minimal consumables and parts. Heating, cooling and vacuum times can be also set for different film and package requirements. The following sealing methods can be combined to create a total of 13 different sealing methods. Select a sealing method to meet your needs, including selecting to best suit the characteristics of the packaged material and to obtain your desired packiaging finish. Set one of the two nozzles for vacuuming and the other for gas flushing. This will increase the gas-replacement rate by de-airing the bag even as the bag is being filled with gas. Especially effective with soft contents. The following sealing methods can be combined to create a total of 13 different sealing methods. Select a sealing method to meet your needs, including selecting to best suit the characteristics of the packaged material and to obtain your desired packaging finish.